Winter can be one of the most gorgeous times of the year: Snow capped trees and white wonderlands can be seen everywhere. However, it is also one of the most dangerous times of the year to drive. The cold temperatures that make the serene snowscapes possible are the same cold temperatures that make the roads icy and treacherous. In a matter of seconds your car can hit black ice and spiral out of control. Even the visible dangers, such as ice and snow, can cause horrific accidents if you are not careful. How can I stay safe on the icy roads? 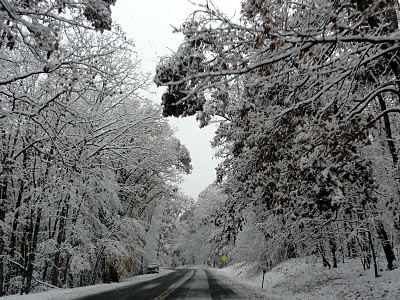 The best way to stay safe during winter storms is to avoid the roads altogether. Always check out the road conditions before you head out. If it looks scary on TV or online, it is probably even scarier in person. Unless where you are going is absolutely necessary (and really, what is worth your life? ), then stay home. Even waiting an hour or two can make a big difference on the safety of the roads. If I do drive, what should I do? First and foremost, always drive defensively. If there was ever a better time to use all of the handy skills you learned at your defensive driving class, it is now. Always keep both hands on the wheel so that you can keep control of the car if you hit a patch of ice. And remember, speed limits are set for ideal road conditions. Winter road conditions are anything but ideal, so make sure to drive smart. Being a few minutes late is worth it. In most day-to-day driving, you should be okay. However, it is always a good idea to have a different set of tires specifically for winter driving that provide you with extra traction and better stopping power. The BCAA also recommends keeping equipment in your car to help you should you get stranded. This can include flares, sand or cat litter, a first aid kit, a flashlight, and a blanket. If you are going over any steep hills, you will also want to make sure that you have tire chains. Driving in the winter can be very scary, especially if you live around hills. If you drive defensively and be smart about when and where you drive, you should have no problem staying safe.